There are 144 posts filed in Recreation (this is page 1 of 15). Authentic retro 80s attire. Maybe half the group went this route, wearing headbands, sweaters, jackets, and pants that were either actually from the 80s or could’ve been. Caricature 80s attire. And about half the group wore stuff that I describe as “What people today think people wore in the 80s.” I was in the camp, wearing a super loud 80s onesie. We picked the perfect day to do this since it was relatively warm, the sun was out, and the sky was blue all day. The groups pics we got at the top of Peak 8 made the whole thing worthwhile (the rest of the day was gravy). This was basically my second time skiing. 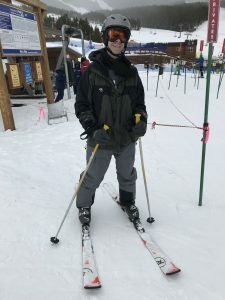 Technically, I skied a few times in high school, but I don’t count those because we were on east coast ice, and no one ever actually showed me how to ski. So I was terrible and I hated it. Last year was the first time I skied on anything resembling powder and I also took lessons, so I immediately felt better about it and made progress quickly. This year was interesting because I was the worst skier in our group, so I was the one holding things up most of the week. But I wanted to take my time and work on some things to make sure I was actually improving as a skier and not just ramping up the difficulty. Our first day on the slopes, I felt pretty uncomfortable on my skis. Skiing is not like riding a bike—and I felt like it was my first time out. But after a few runs, things started coming back and I felt a bit better. By the end of our first day, I felt like I was pretty much back to where I left off last year. I could comfortably cruise down most of the blues, occasionally feeling like I wasn’t quite in control. This was a super long day because we went out early-ish and came home late-ish. We did a bunch of runs and those runs were challenging for me since my form was so rusty. I was totally spent at the end of the day. I wanted to feel in control most of the time instead of feeling like I was just trying to stay upright and avoid wipeouts. So I stuck to blues and slowly improved. Although I didn’t move up to more difficult runs as quickly as I did last year, I made a lot more progress in my first couple of days on this trip. By the end of the second day, I actually felt more like I had control, I could slow down when I wanted to, and I was able to choose my lines rather than just taking wide S turns and hoping for the best. My turns got much tighter and I was intentionally hitting spots that seemed easier to navigate. I actually went in about an hour ahead of most of my peers because I was still beat from the first day, and I felt I had accomplished what I wanted for the second day. I asked a couple of friends where I could find the easiest black run at Breck. The answer came back: “Dukes.” It was a relatively short run that used to be a blue, but they turned it black so intermediate skiers wouldn’t get spooked. So it was technically a black, but only just. My goal for the entire day was to get more comfortable and eventually do at least one black run, so I pretty much mapped out the day to slowly move toward that goal. Even before I started going on this trip last year, there was much lamenting that fresh snow never arrived. It was almost like this specific trip had some sort of jinx on it so that it was always warm and sunny with no new snow during the trip. That all changed this year, and we made up for lost time. 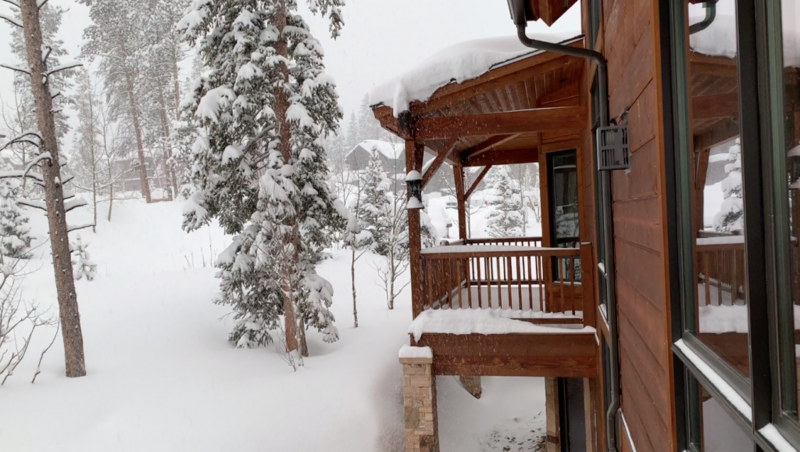 In our last two days at Breck, I think there was over a foot of snow and it just kept coming. So I swapped out my regular skis for “powder” skis to start the third day. At first, this was kind of frustrating because I had to re-learn a lot of what I had worked on the previous day. Turning was harder, stopping was harder, maintaining control was harder. Everything was harder. But once I got used to the new skis, they were much better and easier to control. After several good blue runs, it was time to make my way to Dukes, the easy black my friends recommended. I actually scoped it out during my first run of the day since it starts from a common catwalk that we use to move between peaks. Stay to the right, away from the moguls. Wait for a big opening so I could do “my run” without traffic around me. If I felt like I needed to slow down to regain control, turn slightly back up the mountain to regroup. The lift dropped me about 100 yards from the top of Dukes, so there wasn’t too much time to think about it once I was off the lift. I initially planned to get to the top of the run and give myself a minute or two to gather my courage, but it turned out I didn’t need that kind of time. I got to the top of Dukes, looked at it and thought, “Meh, that doesn’t seem so bad. Let’s go.” And I was off. Overall, it was a pretty good run and I used all three of my friend’s tips. I didn’t quite succeed, but I didn’t quite fail either. I basically ended up spinning out so that I didn’t technically “fall”, but came as close as I could’ve. After a few very ungraceful flailing spins, I found myself stopped, skis splayed, hands on the ground in front of me, holding me up. I regained my composure and it was easy from there on out. I remember getting to the bottom and thinking, “Huh. 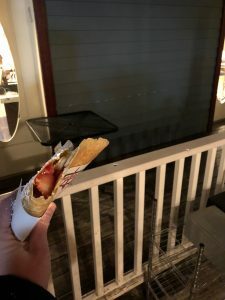 That wasn’t so bad.” I almost talked myself into doing it one more time, but I thought better of it and made my way back to our house. I finished my third day on a real high. I finally felt comfortable on my skis, I felt more in control than I had at any other time this year or last, and I did my first black. But I also felt like I had been pretty lucky so far. I had been really tired a few times during the week, but had managed to get good runs in despite the fatigue. I also had a strained right adductor to watch out for. Before I went skiing, my doctor said, “Sure, you can ski. But don’t do anything crazy and stay off the tougher blacks.” Remember the spinout I mentioned on Dukes? It was exactly the kind of awkward motion that could’ve reinsured the adductor. I’d been rehabbing that stupid thing for 5 weeks, and hadn’t run in almost 10 weeks because of it, and I wasn’t looking to re-injure it if I didn’t have to. So I had a really tough time deciding whether to go back out for our fourth ski day, or if I should just take it easy. I felt like I had been pretty lucky that I didn’t re-injure my adductor despite some close calls. I accomplished my primary goal for the trip—do a black run. The conditions were very powdery, but I wasn’t good enough to really take advantage of that. And powdery also meant cold, snowy, low-visibility. 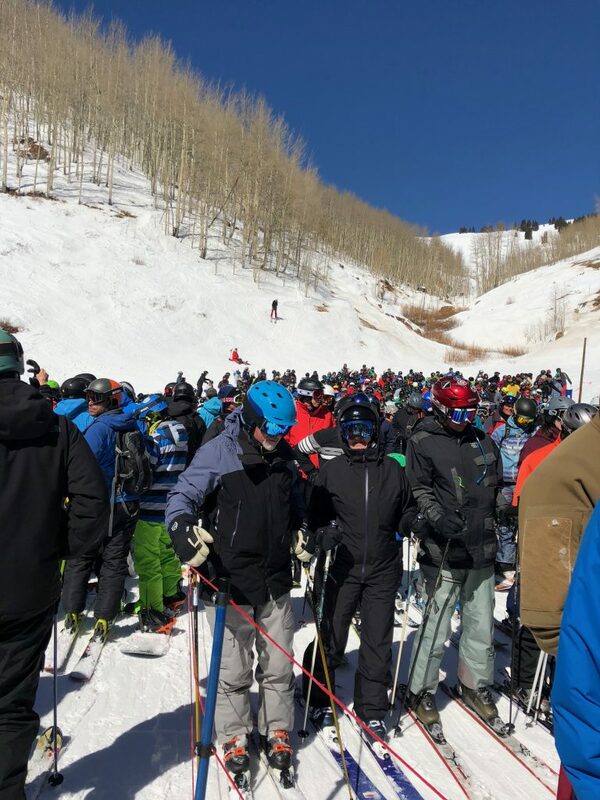 It was the Saturday beginning Spring Break, and I knew the lift lines would be long (so I’d be waiting around a lot, and wouldn’t do much skiing for the time I would be out there). I hadn’t taken a real vacation day—a full day off to just relax—in…I can’t remember the last time I did that, but it was years ago. I decided to just take the day off. If my adductor had been healthy, I would’ve gone out. But I knew that if I went out, I would want to try tougher blacks, and that would make re-injury more likely. Even in hindsight, I’m not quite sure if this was the right thing to do. The coolest part of the ski trip is that each day essentially has two major events: Skiing and hanging out. We checked all those boxes a couple times and hit three of four every night (I think). We had some amazing food—The Canteen, Michael’s, Giampietro, Empire Burger (the sides and sauces are amazing)—but I didn’t document any of it because I was too busy eating it. About half way through our trip, it began to snow. And snow and snow and snow and snow. There was a lot of snow. This made my final ski day a lot of fun, and I’m sure it made Dukes (at least the top part) much easier. My friends said it was the best snow day they had ever seen, and some of them even extended their trip to get more time in the powder. Of course, the snow giveth and the snow taketh away… the ability to travel. 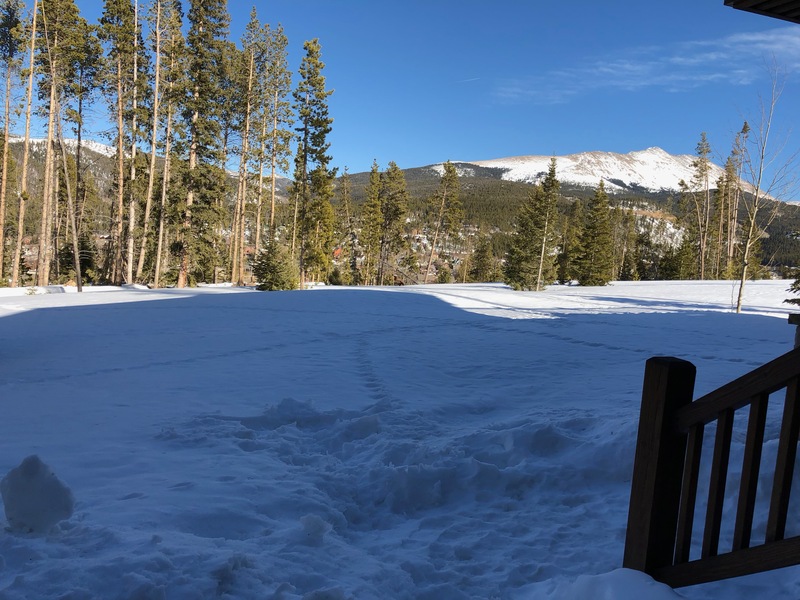 We had a few rental cars with varying numbers of passengers, and some of the cars had trouble either explicitly getting through the snow, or in driving from Breck back to Denver. My car was pretty lucky because we left early. It took us almost three hours to get to Denver (normally two hours), and we had to stop to manually de-gunk the windshield a couple times, but we made it. There was also an avalanche about 20 miles west of us on I-70, so I’m obviously glad we missed that. Some other folks either missed their flights after a long (five hours!) drive to Denver, or simply got stuck in the snow in Breck and had to wait it out (this may or may not have been related to an ill-advised decision to rent a 2WD truck despite a steep driveway and a snow-heavy forecast). When we finally go to Denver, it was 3 degrees outside—the lowest March temperature in like 140 years. Apparently it got as low as -6, so we got there when it was nice and toasty outside. All in all, this was another amazing ski trip and I can’t wait to get back out there and hit some real blacks next year. 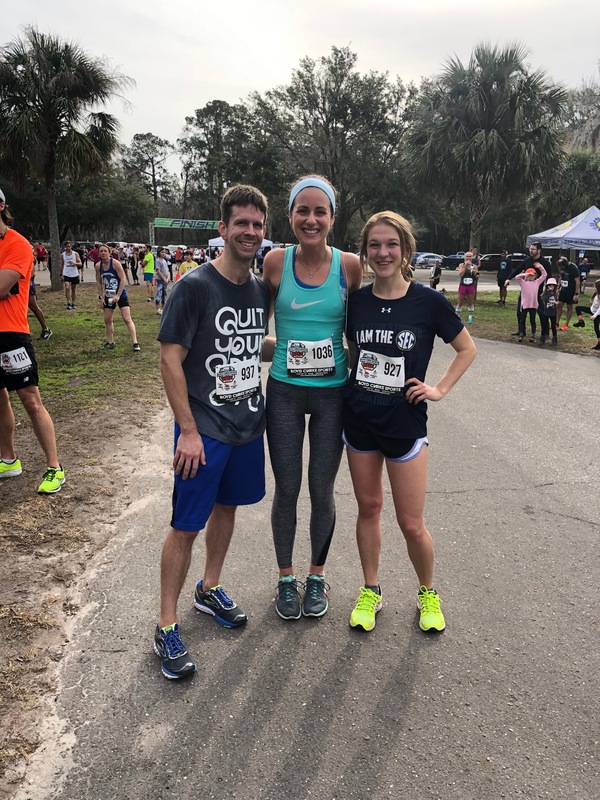 I got peer-pressured into running a Half Marathon a couple weeks ago. 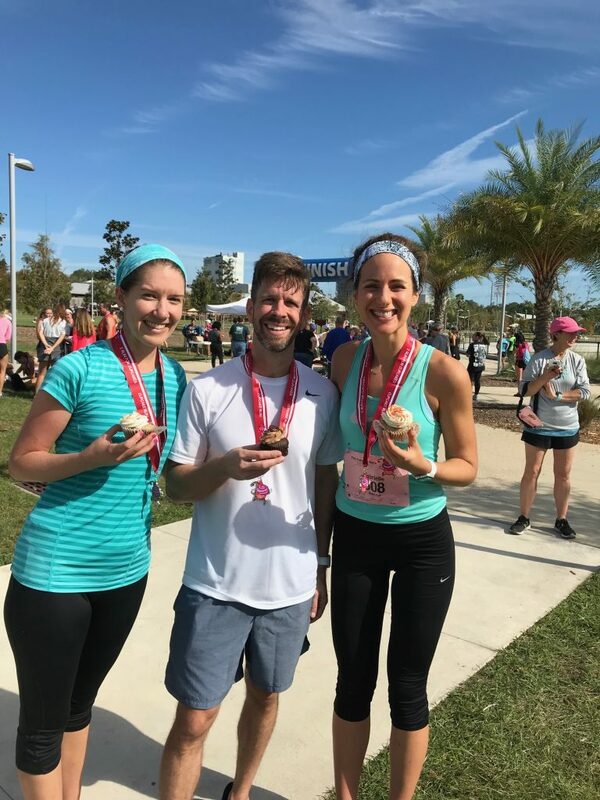 Also I was promised free cupcakes at the end of the race and I have a very, very hard time saying no to cupcakes. So I did some light training, re-aggravated some nagging injuries, and ran my first Half ever. Overall, I’m pretty pleased with my performance. I ran an 8:24 mile pace and finished in a decent time and I finished 9th overall out of 99. But I also ran out of gas on the back half and I couldn’t find enough energy to push for the end of the race. My mile splits just sort of kept slipping and slipping until I finally finished. Part of this was my training—I didn’t run more than 9.3 miles before the Half—and part of it was probably nutritional (I should’ve had some gel packs or something). Overall, it’s a good result and I’m happy I finished. Unfortunately, I went a little too hard in my training two weeks out from the race. I didn’t mean to, but I felt so good on my longer training runs that I just sort of kept going. I started on Saturday with a 15k (9.3 miles) and smashed my previous PR with an 8:00 even pace. Then I did an easy-ish track workout on Monday, but also threw in a fast 800m (a PR of 2:44). Then on Thursday I ran a fast 5k (7:26 pace). I felt really good after all those runs. Then on Saturday, eight days out from the race, I ran a medium-pace 10k (7:54) and that’s when things started hurting. I’ve had a nagging groin injury for a while, and it lit up during this run. Then my knee on that side also started hurting, probably because I was changing my gate to compensate for the other pain. My calf on the opposite started aching too—also probably compensatory. So I went from feeling amazing to having a few dings that would still be sore on race day. Fortunately, I was able to get in for a sports massage session, and that calmed things down enough to finish the race. Still, it’s been 10 days since the race and my calf and groin still aren’t quite right. I just have to take it easy for a while so things will heal. And this also confirms for me that I don’t think running a full marathon is even remotely a good idea for me. Since I hadn’t run this far before, I started off by taking it easy. I held back on my first mile and it still only took 8:15. I was hoping to end up at 8:15 for the entire race, and I felt great at this pace—I thought I might actually hit it! 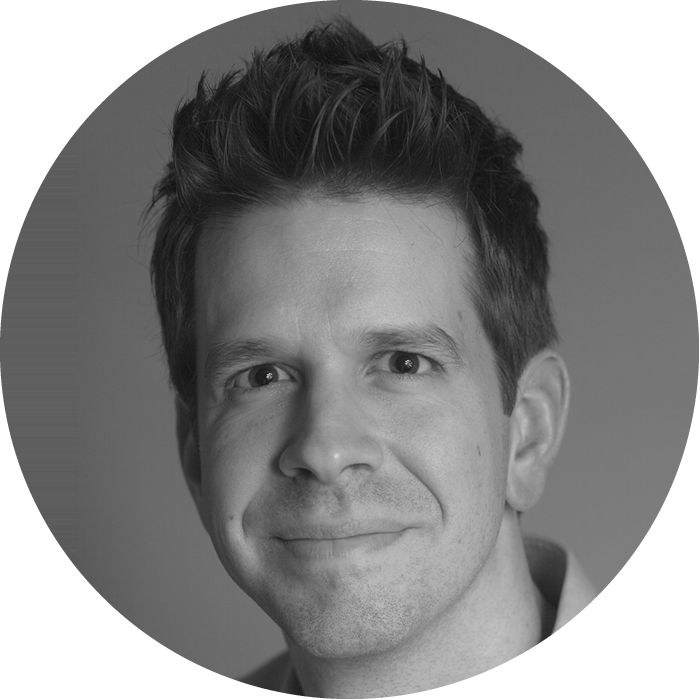 Once we settled in, I was able to start keying off my cadence and how I felt in general. I felt great for the first several miles, but I also knew I wouldn’t feel too great for the last few miles. So I picked it up a little bit and passed a few people, but still held back. The middle of the race was pretty hilly and painful, and I was happy I hadn’t pushed too hard earlier. Once I got near Mile 10, I thought I might try to push and pick up the pace. I did push, but my pace started slowing as I just ran out of gas. I’m fine with that—I expected to get tired on those final four miles since I’d never run that far before. My biggest problem was muscle fatigue—my muscles (especially my calves) just were not used to running that far. My cardio felt really good the whole time—I was never even remotely out of breath, had no side stitches, nothing that indicated I need better cardio. But to go faster, I’ll need to increase my cadence from an average of 171 SPM to at least 175 SPM. To do that, I need better muscle endurance and more late-race energy. I feel like my plan and strategy were very good. I’m not sure I would do anything differently if I could run this race again. Train better. I think I’d be much better off running a few 11–12 mile training runs in the weeks before the race. I think that’s the only way to get my muscles used to doing that much work. It will also give me a chance to slowly push my cadence higher and get used to running faster. Mid-race energy. I drank a few ounces of Gatorade at the mid-way turnaround, but that was it. I should’ve had gel packs or something for a late-race boost. I don’t know much about this, so it’s something to look into before my next race. I’m very happy that my cardio was strong for the race, and not surprised that my calves got tired. I can fix that. But the most interesting thing is that I got a rare chance to literally experience a figure of speech: I went the extra mile. It’s not quite as crazy as it sounds, but it still felt pretty crazy at the time. This particular race was totally disorganized. It was so disorganized that the actual race distances weren’t right. Not even close, actually. About 10 minutes in, I realized the course couldn’t possibly be 13.11 miles. It was an out-and-back race, and I could see that the shorter distances (5k and 10k) weren’t right because I got to their turnaround points before I should have. 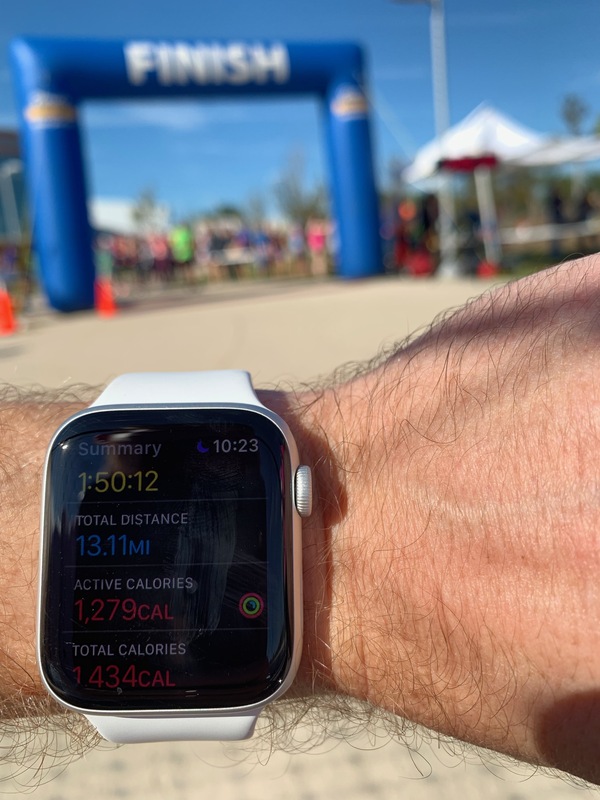 Sure enough, I crossed the finish and my Watch said I had only run 12.1 miles. So I ran past the guy handing out finisher medals, grabbed my medal, and just kept going for one more slow, painful mile. But when I finally stopped, I had completed an actual Half Marathon and I’m glad I did that even if it probably looked a little strange to everyone else at the finish line. Of course, I’m still a little dinged up—my calf and hamstring are both strained—but I finished a Half Marathon and I got to experience a real-life figure of speech to boot. Next time I hear someone say something like, “We need to go the extra mile here.”, I’ll know what that’s actually like. 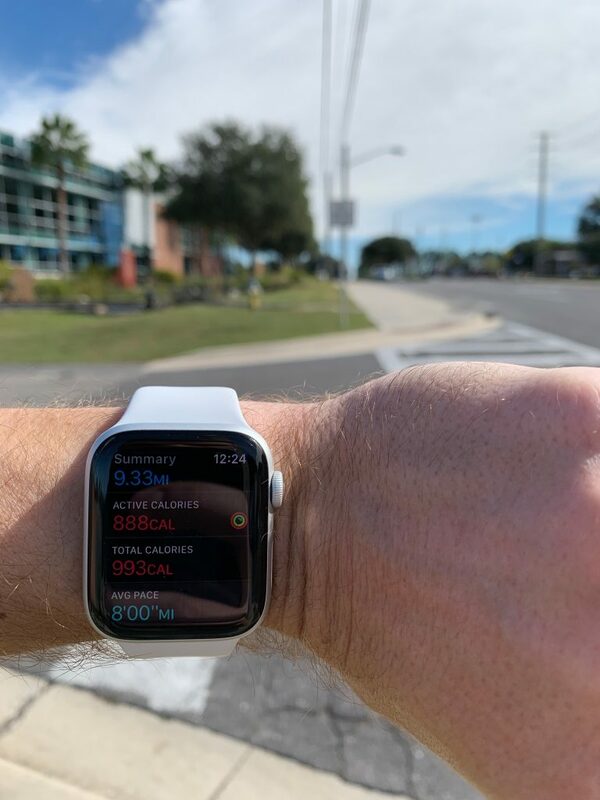 Earlier this week, I ran a mile in under six minutes for the first time. It felt really good for a couple of reasons. First, it’s nice to achieve a challenging goal and it felt good to cross it off my list and see some results from all the hard work I’ve been putting in. 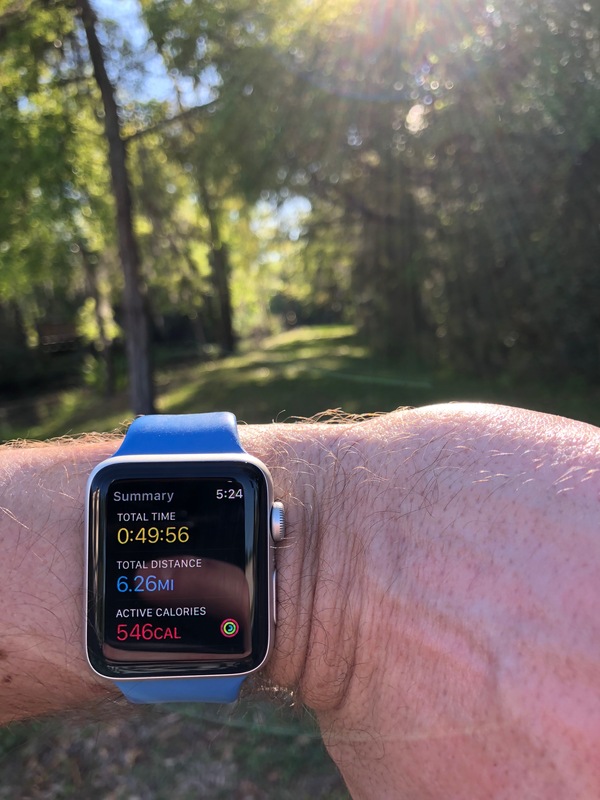 Second, I had already tried and failed to run a six-minute mile twice—both of my previous attempts were about 6:11—and that was really frustrating. I had been so close yet I felt so far away and it really stings to be totally exhausted without much to show for it. But not this time! This time I got it done. What’s even better is that I had a significant breakthrough with this particular goal, but it’s difficult to describe without some context. Before this attempt, I made a lap-by-lap plan so I knew exactly what I needed to do. It’s one thing to know I have to do four laps in 360 seconds. It’s another to know exactly what I needed to do on each lap to make that happen. First lap—1:27 I wanted to start fast because I knew that I could go much faster than the 90-second pace that I required. 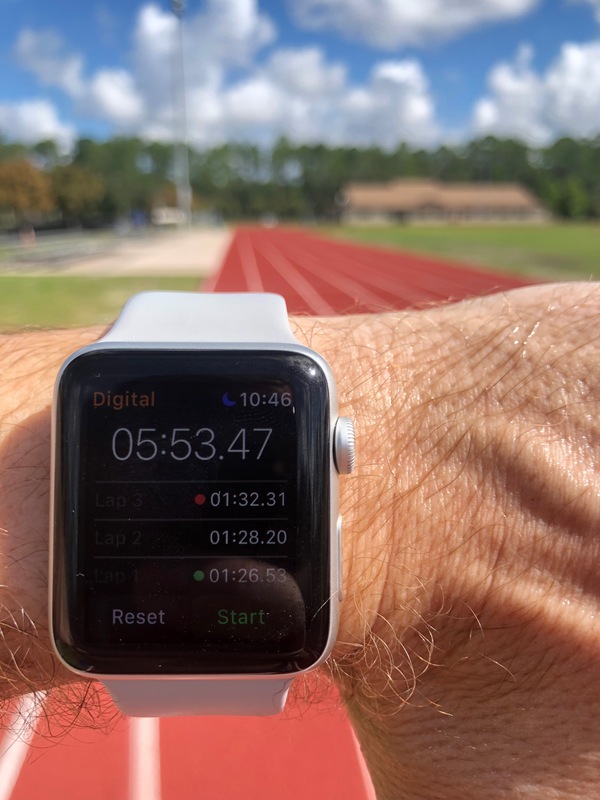 I added about 10m to that first lap to make sure I ran a full mile, so I wanted to be sure that I got around with time to spare on my 90-second-per-lap limit. That would give me some cushion if I slowed down later. Second lap—1:28 I already felt tired, but I knew that would happen and had already prepared myself to just keep pushing and try and maintain the same pace through the second lap. Third lap—1:32 This is when the mental fatigue really hit me. By this point in my run, my brain was repeatedly shouting STOP THIS RIGHT NOW! I told myself that I was going to finish running a mile either way and if I just kept going at this pace it would be over quicker. For the final 100 meters of the third lap, I basically had to get myself to focus on a six-minute pace again knowing I had been gradually slowing down and that I had probably used up most of the cushion from the first lap. Fourth lap—1:26 I actually felt pretty good going in because I knew it was almost over. I’d also kept some energy in reserve, which I think was a result of my recent training to keep my legs working when I’m tired. I started picking it up with about 300m left and began kicking with about 200m left. I went pretty much all-out for the final 100 meters although I never got into a full-on sprint. Even though I had been monitoring my time after each lap, I was really surprised to see a final time of about 5:54. That’s a significant improvement over my previous times. I actually had a little left to give at the end and the overall run went about as well as I could’ve hoped. Before I say any more, take a minute to look back at that recap and see if you notice a theme. Do you see it? There’s almost nothing about the physical difficulty of running a mile. The entire recap was almost entirely about my mental state throughout the run. I started fast because I knew I had to. I got tired, but I knew that would happen so I just kept pushing. I told myself I would finish the mile regardless of how long it took, so I might as well just get it over with. I felt great and had some left in the tank, but I may have left some time on the table because I relaxed a little when I realized I had hit my goal. The last two times I tried to run a sub-six-minute mile, I lost too much time on the middle two laps. Those two laps are really tough because the initial adrenaline rush has worn off, yet there’s still a long way to go. I expected to lose time in the middle due to physical fatigue, but I had also lost time due to mental fatigue because I wasn’t totally prepared. I suspect I’ve been physically ready to hit this goal for over a year now. I just had to try it a couple times to see my own weaknesses and find a way to work around the mental fatigue that slowed me down. And now, of course, I’m wondering if I can get that time down to 5:45. We’ll see. I lay on my back, staring up at the blue sky. I assume it was beautiful, although I can’t really remember because I was desperately trying to catch my breath at 11,000 feet above sea level. I looked past my feet, up the mountain to find my ski. My friend had already found it and was bringing it down to me. “I. Don’t think. I’ve. Ever. Been. This tired.” was all I could say. Our group had just accidentally gone down a Blue run, which we later found out was basically a Black, and it had not gone well. I tried my best to maintain control, but I had gone down the un-groomed part of the run, which meant I was basically skiing down a black on ice. This moment was one of many that we would later call the #VailFail, and it was definitely a low point. But around this low point was a week of high points and a lot of fun. Last week, I went skiing for the first time since high school. All of my previous skiing experiences were terrible, so I wasn’t expecting to have much fun. Fortunately, my friends insisted I try skiing on real mountains with real snow, so I went to Breck to give it a shot. I had an amazing week and really enjoyed skiing. It was a lot easier than I expected and I picked it up faster than I thought I would. So this will be more of an old-school day-by-day recap of my trip, mostly for posterity. A few of us rented a car and drove from Gainesville to Orlando, where we flew Southwest directly to Denver. Then we rented cars and drove from Denver to Breck. Everything was entirely uneventful, which is how I prefer to travel. Once in Breck, I immediately felt the altitude and got winded just walking up stairs and doing other simple things. I also got a low-level headache that persisted for a couple of days despite all the water I drank. We rented a ridiculous three-story house that slept 13 people. “The bunk room”, which I shared with three other guys, was crowded but fun. That first night, we got our ski gear, settled in, and went out for our first crepes of the trip. These crepes are delicious and enormous. Everyone I talked to said, “You should definitely take lessons on your first day. It’s the best way to learn the basics.” This was great advice, which I think they learned to give after other training methods failed. For example, I think they used to teach newbies how to ski using a sort of Scared Straight methodology (“This is a blue run. You will fall a lot, but by the time you make it to the bottom, you’ll be ok at skiing.”), which probably isn’t the best way to learn. So several of us split into groups for snowboarding and skiing lessons. There were only two of us skiers, and our instructor was Dave. There were two other folks in our group, which meant Dave only had to work with four students—that was great for us. We gradually worked through the basics, and I felt pretty good right away. Skiing was already less awful than I remembered. By lunch time, my friend and I had progressed past our two fellow students and were quite a bit more comfortable with the green runs we were doing. 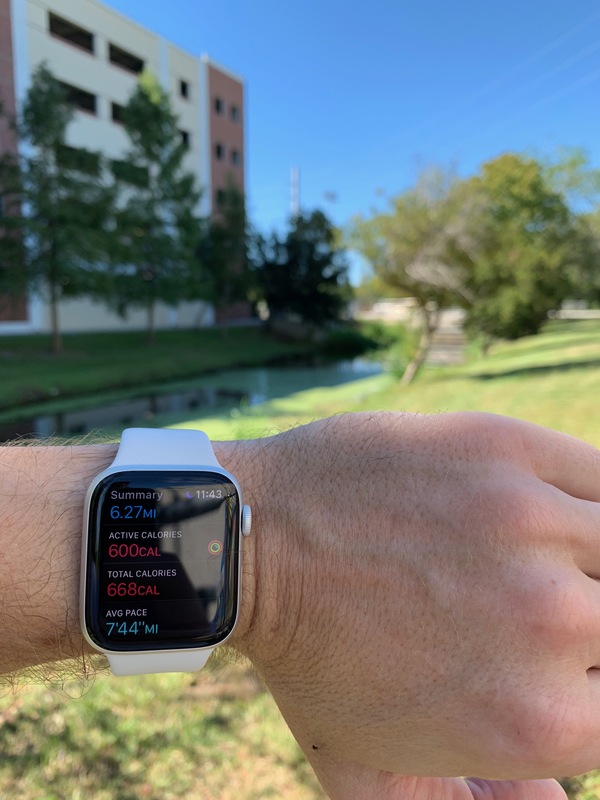 Just before lunch, Dave took my friend and I on a couple runs while the other two members of our cohort took a breather (they were very tired and frustrated, and I think Dave correctly assumed the best thing was for them to rest so they didn’t get hurt). We did our first blue and it went pretty well—we could see that we were making real progress already. After lunch, we did a few more runs, worked on some more advanced (for us) techniques, and officially graduated to “Level 4” (of 5? ), which felt pretty good. We finished the day by meeting up with most of our other friends to ride up and do the 4 O’Clock Home run (which is mostly green with a little blue up top). One of the nice things about the awesome house we rented was that we could almost ski in and ski out. It was super convenient to walk for three or four minutes, put our skis on, and hit the lift. And it was even more convenient to ski down the 4 O’Clock, pop our skis off, and get home in about 5 minutes. After we finished skiing, some of us headed off-site for some hot-tub time while others went shopping to get supplies for our only in-house group meal of the week. I sautéed asparagus for everyone, which meant I got to hang in the kitchen and meet new people as they passed through to see what we were up to. 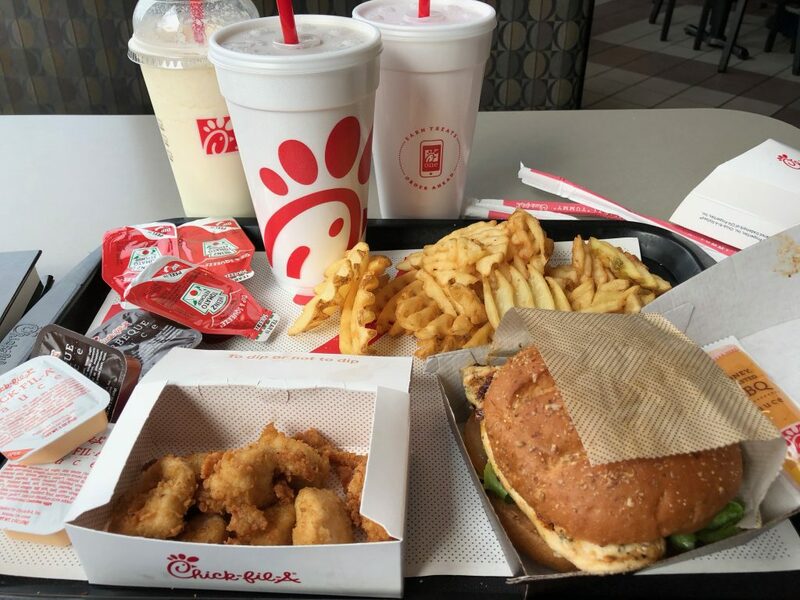 This was probably my favorite meal of the week and I’m hoping we do at least two of these next year. After dinner, we played Body Body Body, which is like a live-action version of a game called Mafia. I’ve always liked Mafia and I like Body Body Body even more. There were about 10 townspeople and 3 mafia members. Once the mafia members have identified each other, we turn the lights out, crank up spooky music, and wander around the mansion in the dark. Mafia members kill townspeople by mock-slashing their throats. Once a townsperson has been killed, they stop walking and drop to the floor. The game continues until someone finds the “body” and shouts “Body body body!” so that everyone can turn the lights on and run to see who died. Then the game moves to the more typical “Mafia”-style game where everyone talks things through and nominates a couple people they think might be in the mafia. Eventually someone is voted out and the game resumes unless the mafia have all been discovered. The game ends when either the mafia are all voted out or there are equal numbers of townspeople and mafia remaining. The game is a lot of fun and we played pretty much every night. My only regret is that despite playing 10+ games, I was never mafia (which is the most fun part of the game) thanks to a series of unfortunate events that culminated in our narrator tilting and skipping one game, causing some logistical snafus that caused us to redraw for spots the one time I actually drew a “Mafia” card. Lessons were physically and mentally exhausting, plus I was still feeling the altitude, so I was admittedly not super stoked to hit the slopes again. By lunch, we were doing Blue runs and I felt pretty comfortable. They were a little fast for me, and I didn’t quite have the control I wanted, but I was able to move down them pretty quickly, mostly maintaining control, and without falling. All in all, a pretty big win. By the end of the day, I felt comfortable on Blues, which was pretty remarkable considering I had taken beginner lessons the previous morning. Some of the group took a short Black to finish the day, but I skipped it. I was super tired and just didn’t want to risk hurting myself with two days left to ski. We went to a local Mexican restaurant for dinner, and it was pretty good. Although… my stomach didn’t take too kindly to it. Normally, this would be no big deal, but an upset stomach plus altitude meant Day 4 at Vail would be challenging. This brings us full circle to the beginning of this post. We decided to make a day trip to Vail, which is about 45 minutes from Breck. At first, it was a smaller group, then it expanded to be almost everyone. 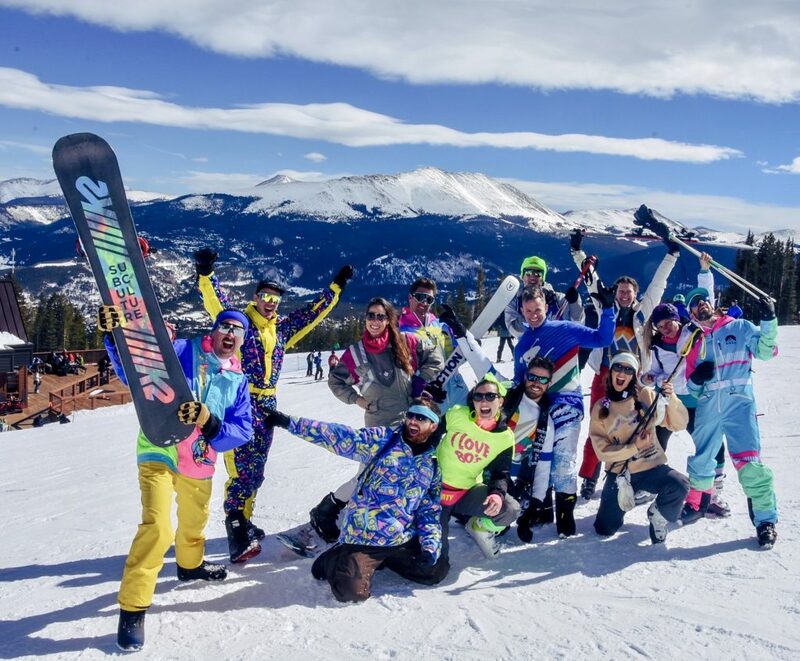 In theory, the skiing is better at Vail, plus we could get an awesome group picture at a famously beautiful spot on the mountain. We arrived at Vail and easily got onto the mountain thanks to some great planning by the more experienced members of our crew. 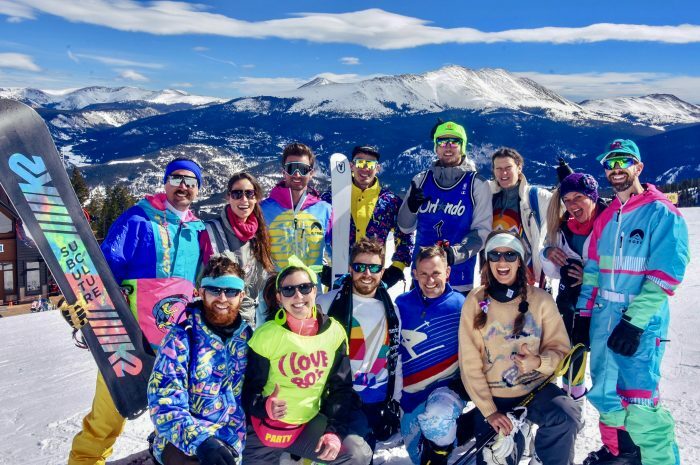 Our first order of business was to rendezvous at the top of Lift 37 for the infamous picture, and then we could all split off into groups based on experience level. Our plan was to take a long catwalk to another catwalk that would drop us at Lift 37. 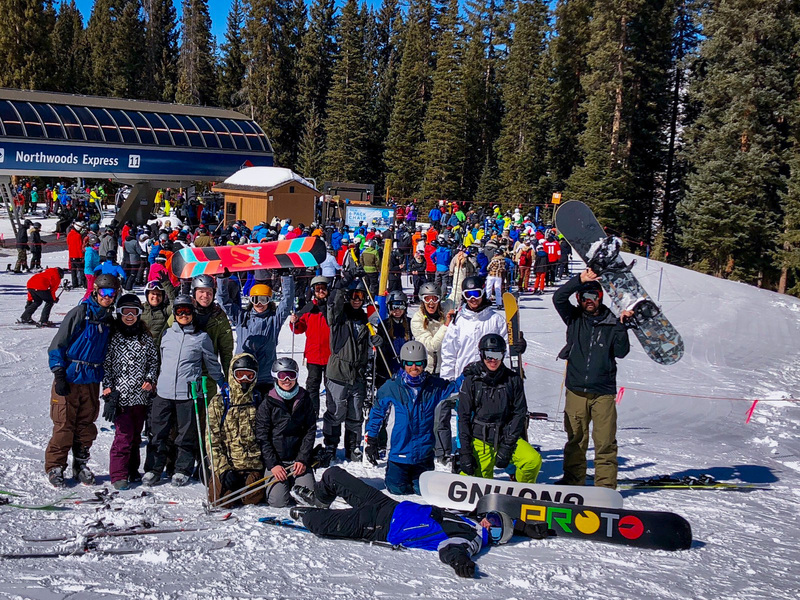 But a Vail employee convinced one of our crew that there was a better way: We could cut out a lot of catwalking by taking an easy Blue after the first catwalk. We knew we were in trouble pretty much right away. The entrance to the first catwalk gave a lot of folks serious problems. I made it down to the catwalk without falling, but it was a dicey run. Once we eventually got across the first catwalk, we stopped to regroup before heading to the beginner-friendly Blue we had been promised. 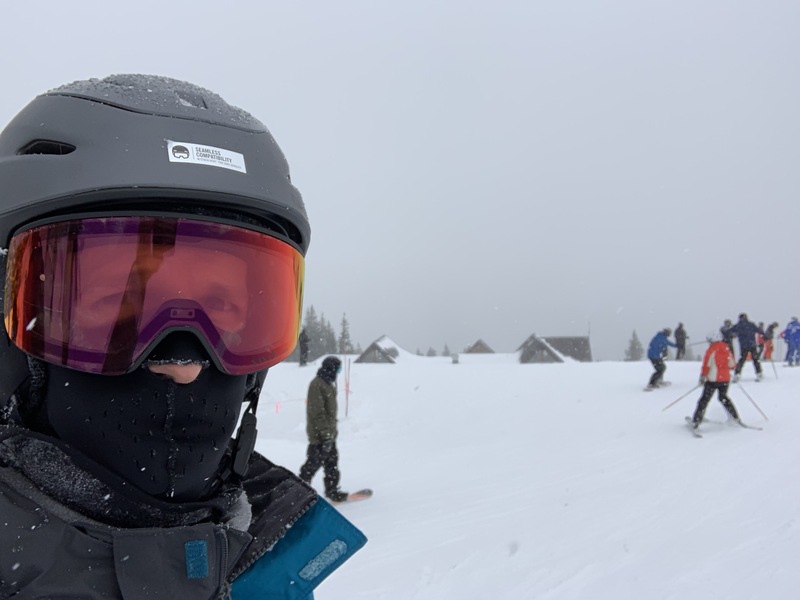 But first, we had to wait out a pretty serious windstorm that made me thankful I brought my balaclava since the wind-driven snow felt like a sandblaster to the face. At last, we all get around to the entrance of the beginner-friendly Blue and we realized… this was not beginner-friendly. It was super steep and icy—not good for beginners. I tried my best to take shallow angles and control my speed, but I just wasn’t good enough to manage it. I fell over a few times—nothing serious—before heading to a part that another skier said was probably a less-steep way to get down. Turns out I was heading for the most steep part of the run, and a more experienced skier in our group later told me, “I saw you heading over there and thought, ‘He needs to turn back the other way or this could get really ugly. '” I did not turn back the other way. Things got pretty ugly. This is the part where I wound up sliding head-first down the mountain on my back, losing one of my skis in the process. Ironically, this may have been the best outcome for me once I chose this particular path. Exhausted from accidentally attempting a Black run, I caught my breath and chugged half a bottle of blue Gatorade, then made my way down to the second catwalk. As I worked my way across the catwalk, the wind picked back up—it was getting worse. Most of us met up at a natural stopping point before heading down to Lift 37. Bad news was waiting for us there: Lift 37 had been closed because of the wind; only Lift 36 was open; there was no way to ski down. A few of us had made it onto Lift 37 before it closed. Some of us were stuck waiting for Lift 36. And others had been so far behind that they were blocked from the catwalk and could not even make it Lift 36. We were now scattered all over the mountain. They had also been slow to close the catwalk, so people continued pouring in as the line backed up. We waited there for over an hour, totally exhausted and dehydrated. And here is where we coined #VailFail. We had been on the mountain for about four hours and had almost nothing to show for it. The back side of the mountain had been closed, we had done like 1.5 runs, we didn’t get the picture we were chasing, and several of our crew were wiped out from the initial “Blue” that we descended. 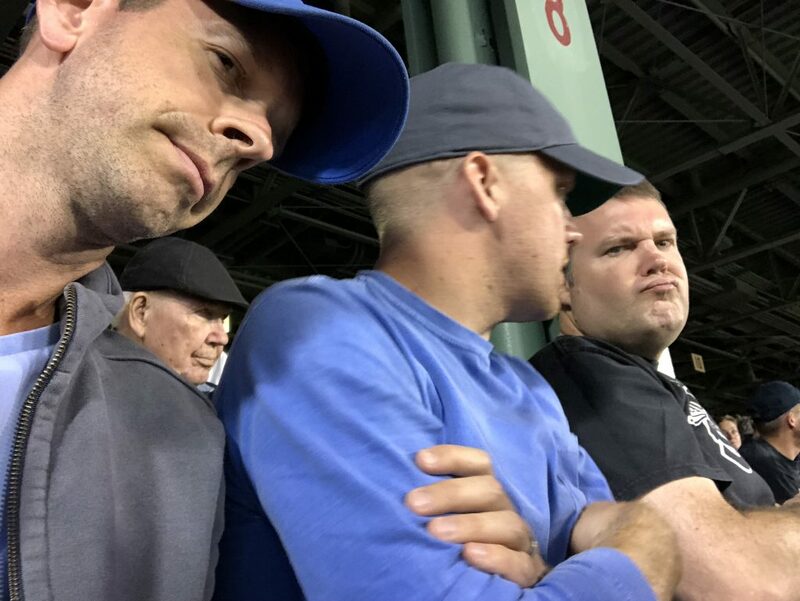 We split up by experience level and managed to get a few runs in before calling it quits and meeting up at The George for an early dinner. Even the Greens at Vail were pretty steep and challenging—some of them harder than the Blues I had done at Breck. After the high of making such quick progress the day before, this was a pretty serious low for almost everyone. I was glad the day was over and that we would be back at Breck for the rest of our trip. This would be our final ski day, and I was really happy to be back at Breck. I spent most of the day doing Blue runs, which all felt really easy after the runs we did at Vail. We all met for lunch on Peak 7, where there was a food court with a fantastic view of the mountain. The last real run I did was Monte Carlo, which is a really long, fun Blue. 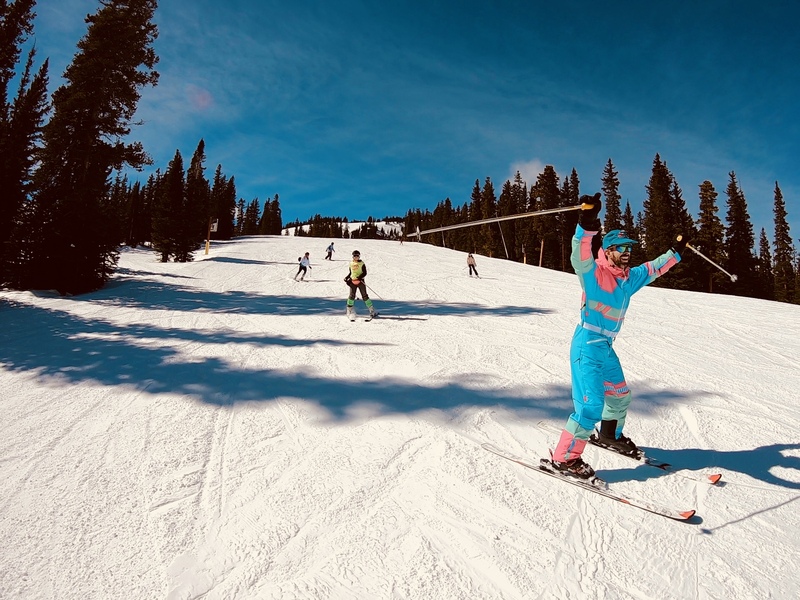 A friend got some photos and video of the run so I have a record of where I was skill-wise after my first real ski trip. I felt much more comfortable than I expected, but can also see that I have a lot of work to do. I finished the day paying it forward: A less-experienced skier in our group and I did a couple of super-slow Blue runs to get down off the mountain. This gave me a chance to help someone the same way I was helped on Day 3, and also gave me a chance to really enjoy the views and reflect on how much I had learned in just a few days. On Wednesday, I had no idea what I was doing and felt accomplished for scooting down the bunny slope without falling over. On Saturday, I was helping another skier get down Blues to get off the mountain. After a long week, I was ready to get home. But first we had to drive back to Denver, fly east for a few hours, rent a car in Orlando, grab dinner and drive back to Gainesville. We would be lucky to get home by 11 PM. But on our way to dinner, we passed Andretti Karting and our crew couldn’t resist. Actually, I could totally resist—I was about 5 hours past my “have fun while traveling” limit—but the other four in our little group were all about it. 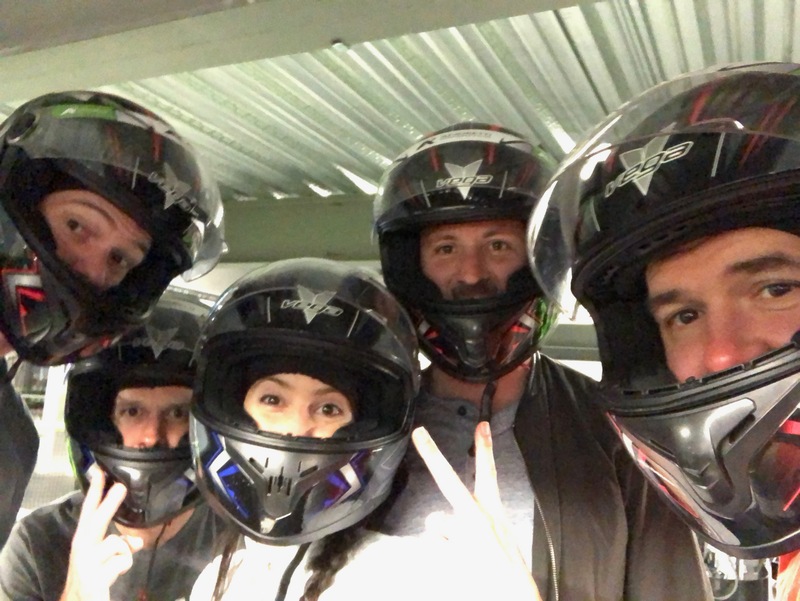 So after about seven hours of traveling, we stopped off for some kart racing. My only options were to just sit around and watch them race, or to join them and hope I could compete despite how tired I was. We warmed up by playing a reaction-time game and two quick-shot basketball games (I won two of three of the games I played) while waiting for our track to be ready. The race was really fun except we were surrounded by terrible drivers who kept puttering around the middle of the track. All of us would’ve gone much faster if we hadn’t had to work around the slower drivers. I tied for 2nd overall, and I felt pretty good about that. Then we finally started our drive home from Orlando, talking about the Oscars most of the way. I finally got home around 1:00 AM and immediately crashed. Before this trip, I had decided I hated skiing. Now I’m looking forward to heading back out next year. My friends were right: I hadn’t really skied before, and skiing out west is much more fun. Hopefully I’ll be shredding Black runs by the end of our next trip.